"It is the biggest honor I've ever had," states Aguilera. "To be able to represent the Air Force and my country in the Invictus Games in London, and to be a part of the first one ever, is a tremendous honor." It's also quite an accomplishment considering the severe injuries he sustained in 2010 while serving in Afghanistan. Aguilera, a Master Sgt. with the 66th Rescue Squadron stationed at Nellis Air Force Base, Nevada, was part of a team that conducted combat search and rescue missions in Afghanistan. "It was June ninth" recalls Aguilera. "Before the sun came up we already had two combat rescues under our belt. Under the cover of night, it's pretty easy to go in and scoop up soldiers and do our mission because we're cloaked and the enemy can't see us, but we can easily see them with our night vision goggles. So, the first two missions went off without a hitch." During their third mission, however, their helicopter was shot down while Aguilera and his crewmates were rescuing an injured soldier. "The shot took out our tail rotor and we ended up spinning uncontrollably. We had to distance ourselves from the FOB (Forward Operating Base) so as not to injure any of our brothers, and then we were over some civilian houses so we had to hold out a little bit longer to find a clear patch of ground. Ultimately, we impacted the ground from 150 feet in the air and 120 Mach force." Four of Aguilera's crewmates died upon impact and he was trapped underneath the fiery remains of the aircraft's fuselage. His injuries were extensive: back broken in 5 spots, broken ankle, femur, ribs, jaw, collarbone, severe burns, and traumatic brain injury. His recovery included over 21 surgeries and 5 months in the hospital. "It was one of the toughest moments of my life," states Aguilera. "I just wanted to die. The doctors didn't know if I would ever be able to walk again. But being around other vets who had severe injuries as well, I realized I had nothing to cry about. Eventually, I realized I am going to die someday, but not today; and when I do join my brothers in the ground, I want them to be proud of me for the life I lived." This was one of the reasons why Aguilera wanted to become active again as soon as possible. Not only to participate in sports and compete athletically, but also so he could go on one last deployment. "I didn't want that mission to be my last," he states. "So, after a year of recovery and training, I was able to get my job back and get my combat status mission back and get back to combat rescue and saving lives. So after 21 years in the military, my last deployment was to Africa to set up the first combat rescue operation there. It was a very successful mission and the operations are still going on there. It was one of the best moments of my military career, and I'm happy to say it was my last one." 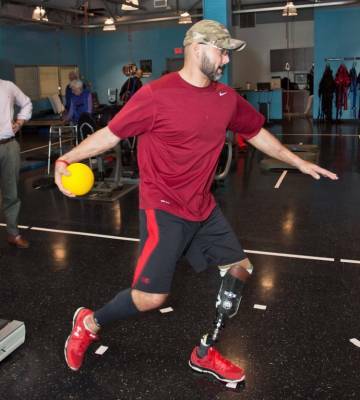 After his final deployment, Aguilera was back in Las Vegas and able to start training for the Warrior Games in Colorado Springs and the Invictus Games in London. "The Warrior Games are like the Olympics for wounded and injured service members and veterans of the military," explains Aguilera. The Invictus Games, held for the very first time in 2014 in London, brought together servicemen and women from 14 nations to compete in athletic games. "Although I could run just fine, I was having huge problems with balance," Aguilera states. "Because I only have two toes on my right foot and what's left of my right leg is severely damaged, and I've lost my left lower leg, my balance is completely gone. Also, what I didn't know at the time was that because of my brain injury, I was having trouble with my vestibular system. If I was standing or reaching for something over my head, I would start to fall forward. It was pretty embarrassing because I didn't know what the heck was going on." Aguilera went to see the doctors at Nellis AFB about his balance problems, but they were unable to help him. "They never really worked with anybody like me before or seen the balance problems I had. They just weren't equipped to deal with someone like me." "So that's why I went to FYZICAL Therapy & Balance Centers and thank God I did!" exclaims Aguilera. The FYZICAL Therapy & Balance Center in Las Vegas is a 5,000 square foot state-of-the-art balance center with some of the world's most renowned balance experts and cutting edge programs. It is the result of 15 years of research and numerous clinical trials. It redefines balance and vestibular care and is one the leading, if not the top, balance programs in the nation. FYZICAL's stellar balance programs are also offered in many of their locations across the U.S., making those practice owners the balance experts in their community. Master Sgt. Aguilera goes on to say, "If it wasn't for Steve (Hurtado) at FYZICAL, I don't know where I would be right now, and I definitely wouldn't have all of these gold medals from last year and all of the success I've had if it wasn't for him. There was a lot of trial and error but the PTs at FYZICAL just kept at it and eventually narrowed it down. They helped me out so much—it's just unbelievable. "Steve was also helping me with my spin technique – he just broke it down for me so I could spin and throw a discus without falling off balance, which is pretty amazing. I was able to walk away with several gold, silver, and bronze medals from both games. He's an amazing guy and I love him... I'll definitely go back and have him help me with that every time I train for these games," states Aguilera. For the record, Aguilera won the Gold in discus throwing, Silver in the 1500 meter sprint, and Bronze in the shot put at the Warrior Games. He won Silver medals in the 1500 meter sprint and wheelchair basketball at the Invictus Games. He was one of only 40 servicemen chosen to represent the U.S. in the Invictus Games. In addition to Steve, Aguilera also credits trainers Chad Cole and Melissa Batterman for helping him train. "I call them my Triad; they're all there helping me get to where I need to go." As for the future, Aguilera hopes to continue to be a part of the Warrior and Invictus games. "I hope to make the team every time," he states. "I'm going to continue to work on my balance and train and when the selection camp comes around, go out there and give it 100%. Even if I don't get selected, I'll go out there and give it my all and break my personal records. I'll be happy with that." "There are millions of people in America with vestibular, balance, and dizziness disorders that many doctors simply don't know how to heal," states ENT specialist, Dr. Dan Deems, MD, PhD. "Those patients have given up on ever being cured and feel their lives are over. At FYZICAL, we are showing PTs how to simply deliver sophisticated balance therapy which allows people to get their lives back." To discover how you can build a world class balance program in your practice, come to PT Revolution on March 14th, March 21st, or March 28th. To register, call 941.444.5970, email info@theptfuture.com, or go to www.ThePTFuture.com.